The Trossachs provide a stunning backdrop to this Scottish country house on the northern banks of Loch Ard near Aberfoyle. Ben Lomond and Loch Lomond just a short drive away. Aberfoyle may be some 3 miles east of the hotel, but that's hardly going to concern you, as it occupies a gorgeous loch-side position just off the B82. This will give you lightning-fast access to the incredible Dukes Pass and the A811 to Stirling. Altskeith Country House is smack-bang in the middle of the beautiful Queen Elizabeth Forest Park. Much of the area has remained unspoiled for some three hundred years and there's a wide selection of recreational activities to be enjoyed including fishing, cycling, clay Pigeon Shooting, hillwaking and watersports. The house is a terrific venue to hold large family gatherings, birthday/anniversary celebrations, special occasions, walking, fishing, water sport holidays (mountain bikes are also available for hire at the house). 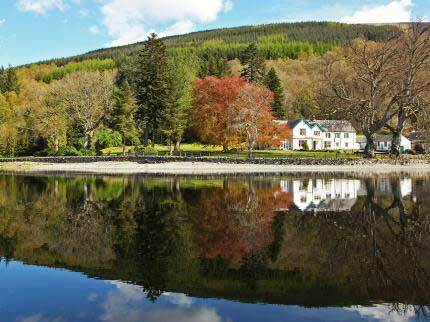 There are ten guest rooms to choose from (9 of which are en suite) and facilities include in-room Broadband, tea and coffee-making facilities and private use of the hotel conservatory with its views across the Loch. There is even a boathouse available for guest use.